Grilled NY steaks with a fresh cilantro onion dredge sauce. 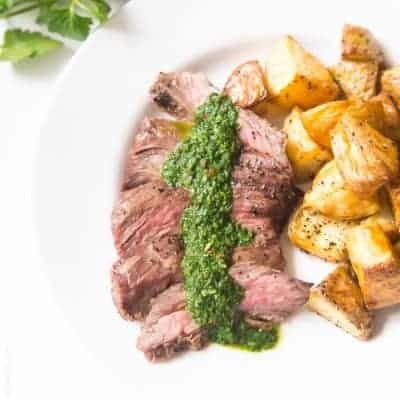 After grilling the steaks, give them a quick dredge in this olive oil and herb board sauce and they will be packed with flavor! Low carb, gluten free, paleo and Whole30. I fought the law and…I WON! Everyone listen up. I successfully got a speeding ticket dismissed in court! I still can’t believe it worked. I have to share this method with the whole world! I only wish I had known about this sooner. Before I share, let me start by saying that I highly respect officers and the law. But here in California, speeding tickets by motorcycle cops is out of control. They are ev-er-y-where. Their only job is to write tickets. That’s it. And the tickets are INSANELY expensive. For my speeding ticket, it was $377 for speeding, and then $424 to be able to go to traffic school so my insurance wouldn’t go up. And I would still have to pay for traffic school separately. Around $1000 for going 75 on the freeway?! Holy smokes! Please tell me how that is reasonable. My friend is married to a cop, and he let me in on a little secret. If you ever get a ticket, if you fight it in court it is unlikely the cop will show up. If he doesn’t show up, the ticket is automatically dismissed because he is not there to give testimony. He said you have at least a 50/50 shot of them not showing up. I kept this in mind in case I ever got pulled over again. Which I did in July early in the morning on my way to work. I was very nice and respectful to the officer as he was giving me my ticket. I tried to be unforgettable. After I got my ticket, rather than paying it, I went to the court date posted on the bottom of my ticket and plead “not guilty”. Very easy. You check in first thing in the morning, then get shuffled in to the court room with everyone else who has traffic related issues that morning. The judge calls up each person, reads you the traffic issue you are there for, and asks you how you plea. I said “not guilty”. Then he asked if I would like to have the court date within 60 days, or if I would like to waive my right to a speedy trail. I said “within 60 days”, mostly because I am pregnant and wanted to get this taken care of before the baby comes. Then I was assigned a new court date to appear in front of the judge and plead my case. This took maybe 3 hours of my time, including driving roundtrip. I had my court date to appear on Friday. There were a few cops standing outside the courtroom waiting to go in as well. I walked by them to read their name tags to see if any of them was the cop who gave me my ticket. No matches! I was starting to feel pretty good. They opened the courtroom and we all went in. There were probably 30-40 civilians there to plead their case, and only 3 cops showed up! 3! Everyone else got their tickets automatically dismissed. That is WAY better odds than 50/50. When you get in, the court facilitator goes thru and takes attendance by reading off each persons name, followed immediately by the officer who wrote that person their ticket. So you know right then if your cop showed up or not. Mine didn’t! Then, you wait for the judge to come in. The judge goes thru all the names again. And if your cop wasn’t there when they took attendance, the judge tells you right then that your ticket is dismissed. No fine, no points on your license, nothing. It’s almost like it never happened! The energy in the room was so happy. Then you just wait for them to adjust it in the computer, and they give you paperwork for your records stating that your ticket was dismissed. This took another 2 hours of my time, including drive time. The great thing about it is you have absolutely nothing to lose! Worse case scenario the cop does show up, you plead your case, and the judge doesn’t dismiss it. You just have to pay the ticket. They can’t raise it any higher. You’re just out your time trying to fight it in court. But for that much money, I was willing to gamble my time. I have baby stuff to buy! So for 5 hours of personal time, I got out of a very expensive ticket. Was the best way to end a Friday. Shawn was ecstatic! I called him as soon as I got out of court to let him know the good news. It felt like winning the jackpot! He told me to hurry home, we’re celebrating and he would be cooking his NY steaks with cilantro onion dredge. I love watching Shawn grill, he is in his element in front of that bbq. Of all the many grilled steaks Shawn makes, this is by far my favorite. Shawn has been making this cilantro onion dredge sauce for our steaks for years, and I just love it. He makes this delicious board dredge sauce with olive oil, garlic, chopped cilantro, grated onion and salt + pepper. You grill up the steaks as you normally would, and 1 minute before they are done cooking, you coat them in the cilantro onion dredge sauce. 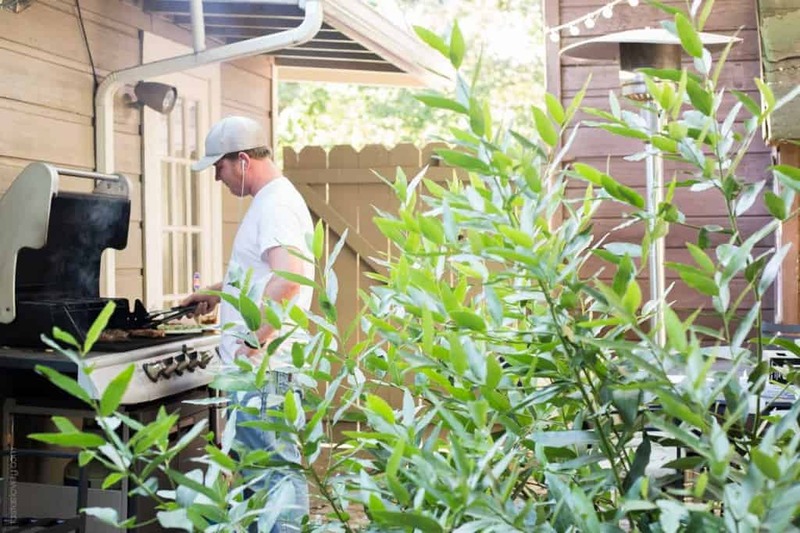 You throw the steaks back on the grill to cook another 30 seconds per side. They get infused with delicious, fresh flavor. This is perfect for New York steaks, which are good but don’t have a ton of great marbling and flavor on their own. Since I don’t like paying double the price for filet mignon, this is a much more affordable way to have an amazing steak dinner. Even though getting out of my ticket certainly freed up some money, *wink, wink*. 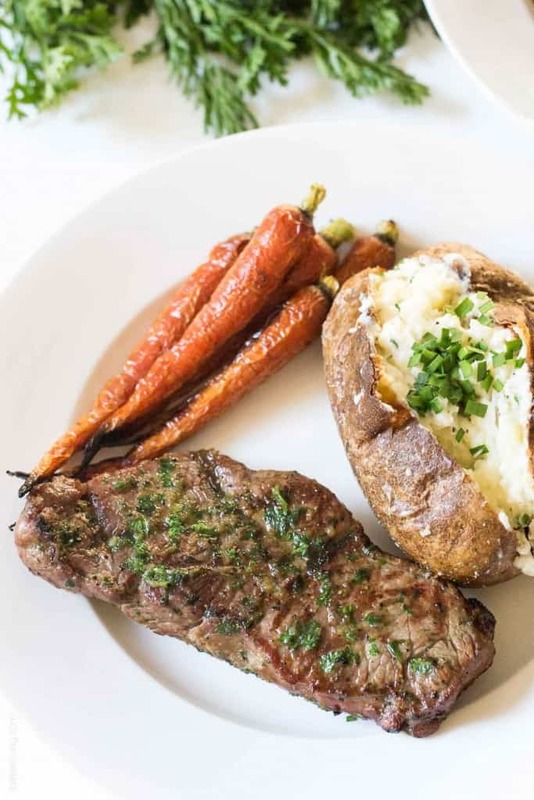 Be sure to serve it with my steakhouse style baked potatoes, you will feel like you’re eating at the fanciest steak restaurant in town! Heat your grill (or indoor grill pan) over high heat. Clean the grates and coat with olive oil. Season the steaks generously with salt and pepper. 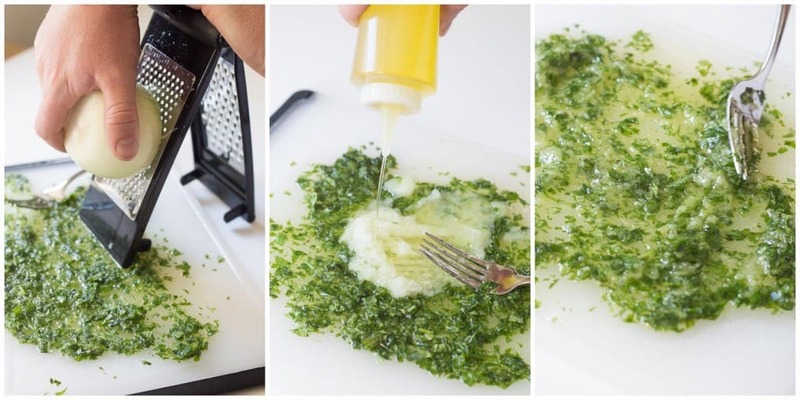 On a cutting board or large plate, make the dredge sauce by combining the cilantro, onion, garlic, and olive oil. The amount of olive oil really depends on how much onion and cilantro you are using. You want it to look like a thick marinade, not too runny. Season with a pinch of salt and pepper. Stir together with a fork. Cook the steaks on the grill. The cook time will depend on the thickness and size of your steaks. Typically just about 5 minutes per side for medium rare. 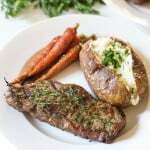 Remove the steaks when they are 1 minute away from being done, and coat both sides of the steak in the cilantro onion dredge sauce. 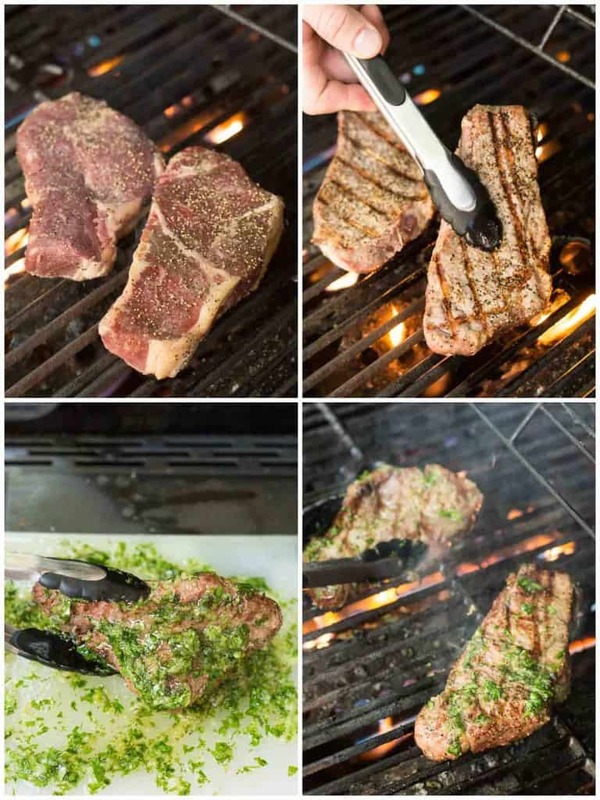 Return the steaks to the grill and cook for 30 seconds more per side. Remove from heat and allow the meat to rest for 5 minutes before cutting in to it. We love this meat thermometer so we know when the steaks are cooked to medium rare! No more guessing! That is crazy insane! $1000. No wonder you worked your way out of it! So glad it worked out for you. I know these steaks sizzling in my ears are working out for me. We’re loving cilantro lately. Looks incredible! Oh, nice! I love recipes that don’t necessarily need to wait for 2 days for the marinade to soak in the steak. Oh my gosh! And I thought the cops around here were harsh! That is crazy-expensive just for speeding! So glad you fought it out though and won—like you said, there’s baby stuff to buy! And other important things like steak for instance?? Holy MOLY, I am seriously drooling all over the place right now! 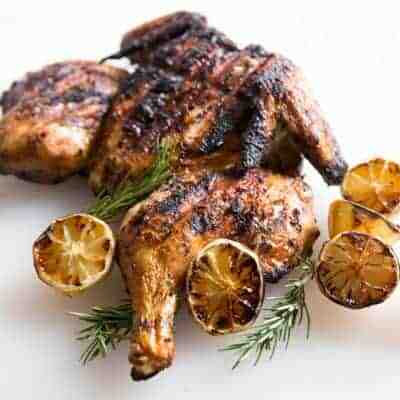 Love love LOVE that herb marinade! Wow good job on getting the ticket dismissed! I’m definitely going to remember that for the future. This steak looks amazing, Natalie! I love the sauce over it. Sounds like the perfect meal to me! That is awesome! Good for you! Darryl has tried that before and the cop DID show up, but I’m happy it worked for you! 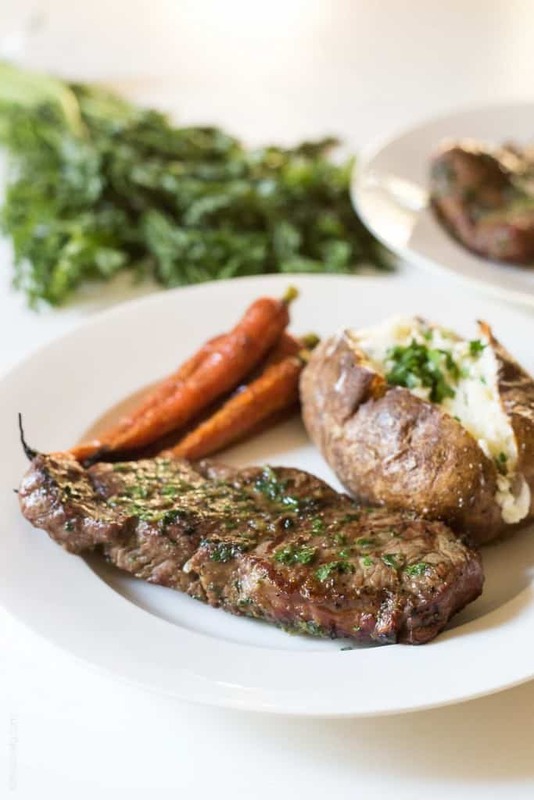 These steaks look delicious, a perfect way to celebrate! Yay for getting out of tickets! I need to remember that for next time!! And I am drooling over this steak. We hardly ever eat any red meat and I wish we would cause it is just SO good! 75? You were only going 75? I suppose technically that would be considered speeding here, but if I actually went 75 (on the highways) I’d probably get run over! I’ve only ever been pulled over once and it was when I lived in PA. It was 1am and I was coming from a friends house. I was pulled over for “going through a stop sign” but I assure you I didn’t run the stop sign. I think he was hoping to get a DUI because of the time and because it’s a SMALL town. I was very respectful, but you would of thought it was an episode of cops – he screamed at me to step out of the car and immediately gave me a breathalyzer test without doing a field test! I told him I only had 1 beer at about 8pm, but for some reason he acted like I was drunk. I complied and struggled to blow into the darn thing – I almost passed out due to my low blood pressure! Finally once it registered (after 3 tries) he saw that I was indeed not intoxicated. He let me get back in the car and then gave me a ticket for the stop sign!! I was so mad. I decided against fighting it because I knew the cop would show up (small town) and I didn’t want to take a day off of work for that. The ticket was only $150 so I just paid it, but I do think I could have complained about his treatment of me. Anyway, I would have fought it too at those prices that you would have had to pay! So glad you were able to have it thrown out! This recipe is perfect since I’ll be starting whole30! Looks so easy and delicious. Wow, $1000? That is insane! So glad it all worked out for you :) This steak is cooked to perfection! Love the cilantro sauce! I love celebrating the everyday victories! What a relief, Natalie! I’ve not had a ticket in a long time… the last time I’ve experienced anything related is when Rob got ticketed by a red-light camera. He must of just got in on the tail end of yellow… I was with him. But there was no getting out of it. The camera showed all! So now we are super careful because, I think the ticket was around $205!! Yikes! That dredge sauce is mouthwatering my dear! Congrats on beating the speeding ticket! That is always the best feeling. And celebrating with these steaks was a brilliant move on your husbands part. Haha, Natalie you are so funny! I am preeeetty sure it doesn’t work that way here — I think the cops actually show up! Lol. Glad you got out of that sticky situation anyways. Steak is a great way to celebrate! Wow! SO expensive! I can’t imagine! 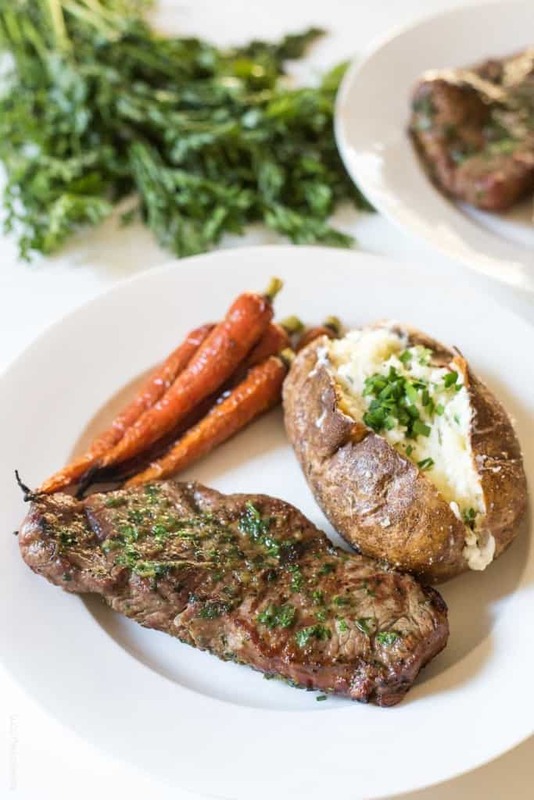 I love this idea for a really good steak dinner! 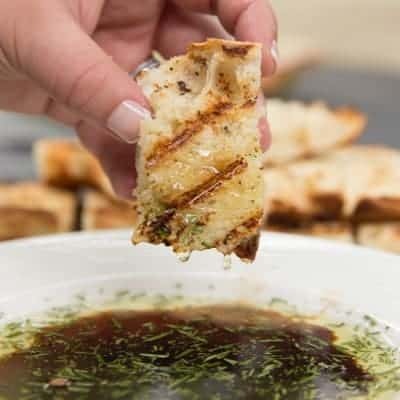 I have my go to marinade but this cilantro onion dredge sounds perfect!